On a recent work night out, we were treated to a meal at theme restaurant, Papa Joe's (locations in Dundee, Dunfermline and Stirling!). After downing a few beers at another local establishment, we made our way to Papa Joe's ready for a fine Italian meal in Dundee. I initially thought that Papa Joe's was trying to be an American themed restaurant along the lines of TGI Friday's, but, after a quick glance at their website, I soon discovered that good old Papa Joe has been serving Italian food to the fine people of Scotland since 1933! Be that as it may, I'll bet that those menus from the 1930s were lacking in the one thing that caught my attention this fine spring day in Bonnie Dundee. Namely - NACHOS!! As part of the rules of the game, if they have nachos there, I have to try them. This was even better, because someone else was paying for it! After a wait of a few minutes, the nachos were finally produced. 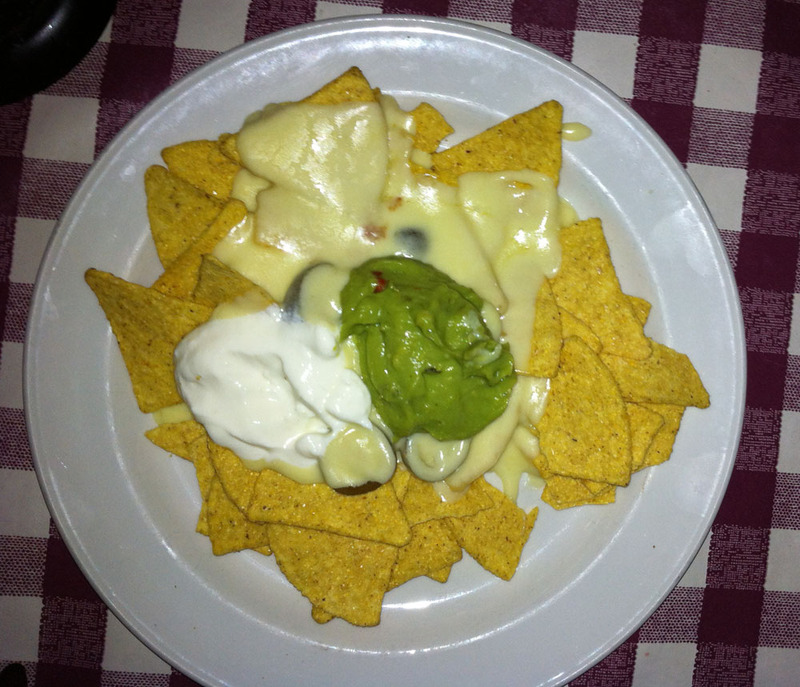 The best part about these Dundonian Nachos is that they tasted a lot better than they looked. I was a little disappointed about the absence of lettuce, but can't really fault Dundee or Papa Joe's for that, since it doesn't seem to be a universal topping, even in Texas. The guacamole over here tends to be some type of pre-processed substance and probably comes out of a tube, which, again, you can't blame Dundee, because that's the way that Taco Bell does it. But it tasted pretty good. Extra bonus points because they included jalapenos (hard to see but they're in the middle of the photo, kind of trapped beneath the guacamole and cheese). All in all, a surprisingly pleasant nacho experience in the land of the Scots.